Reorganize Today, LLC: Ornaments for Christmas-Outside of the Box! Ornaments for Christmas-Outside of the Box! What is your favorite Christmas ornament and why? Was it from someone special? Does it remind you of a special occasion? I have begun adding ornaments that go beyond the traditional. Anything that can hang on the tree can be an ornament! Recently added were my graduation cap tassels and old cookie cutters from my mom as everything was in storage and now I see them once a year. 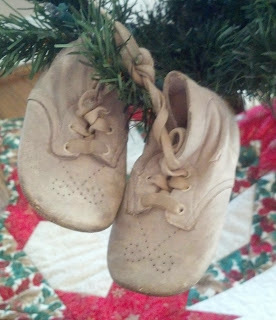 I also added my husband's baby shoes after taking them out of storage and adding a special touch to our Christmas tree. It is another way of repurposing what one has. I had a trip down memory lane while I was decorating the tree this year. A friend purchases key chains when she travels-they are small and inexpensive. These are added to the tree and she and her family can relive the travel time shared. Do you have special memory items that could come out of storage and be placed on your tree?